Caswell Australia. DIY Chrome Plating kit, Aluminum Anodizing kits, Gold plating kit , Brush plating, Powder coating, Aluminium Polishing and Buffing Supplies. For Australia and New Zealand. ANODIZING SUPPLIES AND PROFESIONAL DIY RESULTS. Caswell Plating Australia sells every anodising plating kit possible for the home DIY plating or anodising experience. Caswell Australia provides expert local knowledge and expertise to allow the home plater using our home plating kit, powder coating guns, anodizing kits or aluminium anodising dyes to achieve professional electro plating or metal finishing results from home. Anodizing, or anodising, is an electrolytic passivation process used to increase the thickness of the natural oxide layer on the surface of metal parts. Anodizing increases corrosion resistance and wear resistance, and provides better adhesion for paint primers and glues than bare metal. Anodizied alumimum can absorb dyes. Anodizing is also used to prevent galling of threaded components. This process is not a useful treatment for iron or carbon steel because these metals exfoliate when oxidized; i.e. the iron oxide (also known as rust) flakes off, constantly exposing the underlying metal to corrosion. "Stay-Brite" is sometimes used as a market name for products made from anodised aluminium such as brass replica. Anodization, or Anodising in British English, changes the microscopic texture of the surface and can change the crystal structure of the metal near the surface. Coatings are often porous, even when thick, so a sealing process is often needed to achieve corrosion resistance. The process is called "anodizing" because the part to be treated forms the anode electrode of an electrical circuit. Anodized aluminium surfaces, for example, are harder than aluminium but have low to moderate wear resistance that can be improved with increasing thickness or by applying suitable sealing substances. Anodic films are generally much stronger and more adherent than most types of paint and metal plating, making them less likely to crack and peel. 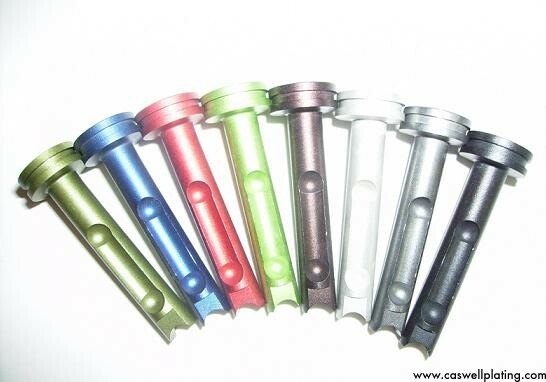 Caswell Australia can provide everything you will require to anodize at home, and much more. 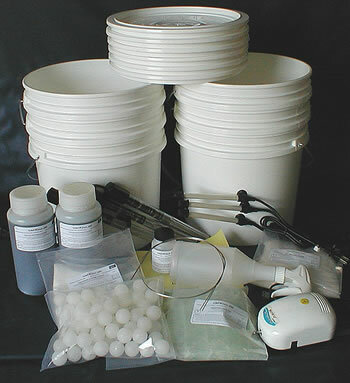 We stock a large variety of anodizing dyes, anodising sealers, and anodizing instructions via print or DVD. Home anodising has exceptional results and thousands of applications. 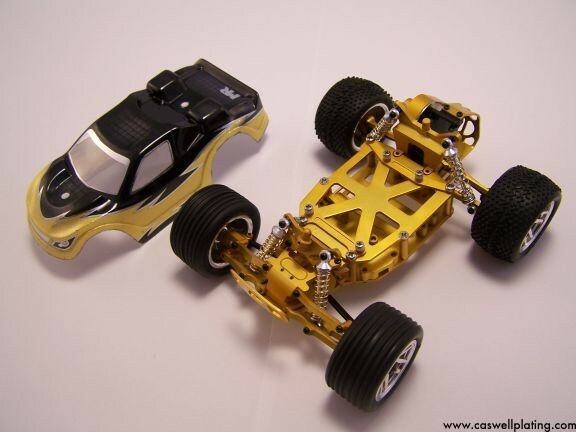 Some of the most impressive and common results come from remote controlled models and paintball guns. With such impressive results from previous customers of Caswell we saw it only fitting to include a page or two to highlight the finished anodized result. We can help you with all of your anodizing enquiries, however the correct spelling of anodizing versus anodising or aluminum versus aluminium is still being debated and we will not enter in to that, just know however you choose to say it or spell it we can help you anodize yourself at home using the highest quality Caswell anodising kits and anodizing dyes. 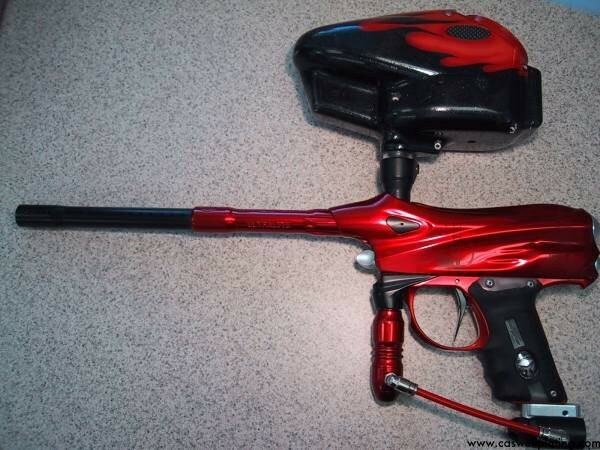 These professional quality anodizing dyes provide consistent, quality results. The same dyes are sold to professional anodizing shops all over the world. Each 4oz bottle of dye concentrate makes 2 Gallons. 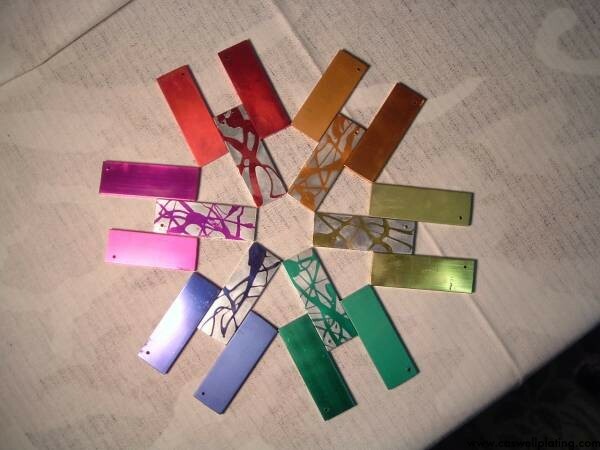 Each anodizing kit consists of 6 dyes and is supplied with a colour wheel The Colour wheel can be purchaced separately as such our range of anodizing dyes. 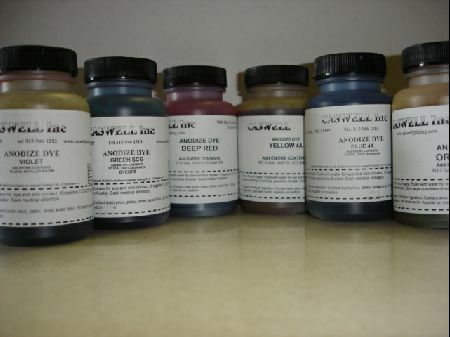 Dyes can be mixed together to create a host of different colors. The dyes are in concentrated liquid form, a 4oz bottle makes up 2 gals of ready to use dye. To make up different colors, we suggest that you make up the colors to the correct dilution first, then take a quantity of each dye and blend them together. Provides 0-30V adjustable output with current up to 5A continuous at all selectable output voltages. Adjustable current limit control (0-5A), high and low current front panel terminals, thermostat controlled cooling fan & overload protection. This solidly built laboratory grade linear power supply provides well regulated 0-30 Volt adjustable DC output with current up to 5 Amp continuous at all selectable output voltages. An adjustable current limit control (0 - 5A) is also provided. Includes separate voltage and current metering, overload protection and a thermostatically controlled cooling fan. 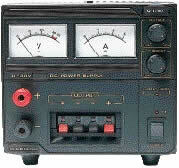 This unit has both high current and low current front panel terminals.